After having gotten up at 5:15 and watched Anthony for an hour, Fumie got up and let me go back to sleep, which I did until 11:30, feeling totally drained when I did get up. I needed to catch up on sleep, and the 5 extra hours wasn't enough (but was extremely appreciated). Toward the later afternoon, I set out with Anthony on the bicycle (the first time I'd taken him out alone on the bike) the to furniture shops to take a third look at desks and chairs. The one expensive chair I'd looked at was the Okamura “Contessa”. It's adjustable every which way, and may actually be comfortable to sit and work in (unlike any chair I've ever really used). I won't be able to tell unless I spent some time adjusting for me, and using for a long period, so testing in the store is not sufficient. At $1,300 or so, it's a lot to gamble on. One of the main reasons I went again was to get the web site of the manufacture, so I could research it (and perhaps find a cheaper price) on line. Unfortunately, I couldn't find anyone online selling that chair. I then went to the place selling the plain “eastern mahogany” desk, and decided to put my order in. It'll take 3+ weeks to arrive. One interesting thing I noticed on the way there, while waiting for the light at the corner of Nijou and Kawaramachi, was a very thin apartment building. In the center of the picture is a spiral staircase going up about 10 floors. 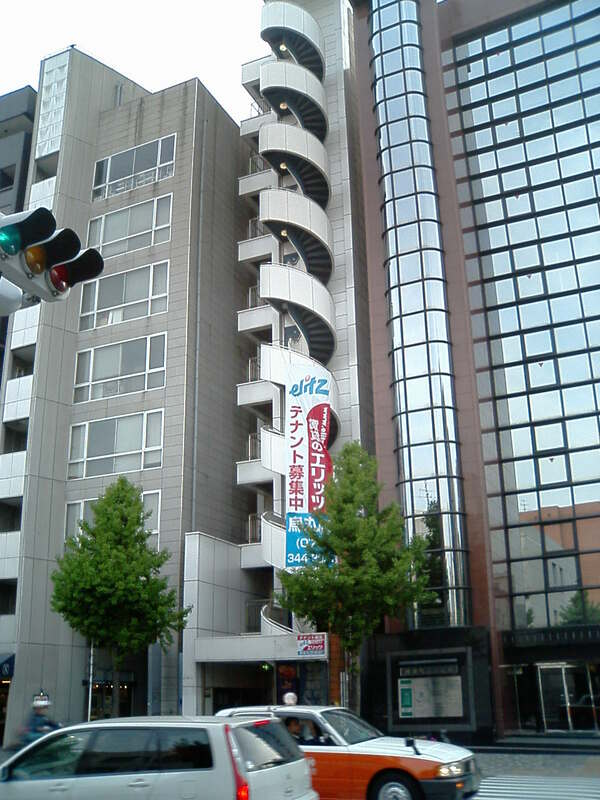 The staircase takes up most of the front of the building — it's not connected to the dull gray building on the left, nor the brown & glass building on the right. I noticed as someone on a bicycle went by that the width of the entire building was about the same as the length of three bicycles. You can't seen in the pictures, but the room numbers are the same as the floor numbers — 1 through 10 (one apartment per floor). After the furniture stores, I had an hour and a half to kill before 6:30 mass, so I went to the Kamogawa river (which runs along Kawabata street, which is a 15 minute walk from the house). The river is set well below the level of the surrounding city, and there are bike/walking paths on either side. The paths are very nice – I hadn't explored them at all – and was shocked to find such a wonderful hidden treasure so close to the apartment. There were people walking their dogs, riding bikes, doing tai-chi (or whatever), nature photographers (the name of the river means “wild duck river”, and indeed, there's plenty of ducks, tall white cranes, and other wildlife), couples on dates, and groups having picnics. It was a wonderful, wonderful find. I stopped with Anthony to look at the ducks, and to let him run around and hopefully burn of some energy. It was a nice time. I then thought to explore more, and so rode north (upriver) several kilometers, and it just got nicer and nicer. There were short (1- or 2-yards tall) waterfalls every block or so (you can tell the blocks due to the bridges), and in general, it's a wonderful place to relax, it seemed. Time was running late, so I turned around at what turned out to be Imadegawa street. To do this, I had to take a path that rose up to street level, cross the bridge, then take a path that went down to river level again. They're not at every bridge, but luckily both were here. On the return path, I exited early (at what turned out to be Marutamatchi Street) because I didn't know whether there was an exit near the church (at Ooike Street). I took some back streets to stay away from the traffic on the main street, and made it to church about 30 seconds late. I didn't have the stroller, so felt fairly worried about how Anthony would act. Luckily, he was mostly wonderful throughout (I kept him full of raisins and small crackers, which helped). We got home a bit before 8:00pm. Lately, he's been going to bed later and later, but getting up at the same 5:15am, which means less and less sleep. I'm of the impression that babies his ages should be sleeping at least 12 hours at night, plus naps during the day. Even though he slept almost four hours earlier in the day, it still didn't make up for the lack of sleep at night, so we decided to take him for a stroller walk to see whether he'd be lulled to sleep. The temple across the street from our apartment, Shorenin Temple, is one of the most famous in Japan. It was in a list of the top 30 temples I saw once (note that there are well over 30 temples within a mile of here, so to be in the top 30 in all Japan is sort of big). The streets around here are packed on the weekend as tourists (mostly Japanese) visit this and many of the other temples around. Anyway, starting today, they were doing a special “light up” in the evenings. They're normally closed at night, but for a week they have things lit up beautifully at night. We haven't actually visited it yet, so thought this would be a good chance. Unfortunately, bringing in a baby stroller was frowned upon (it's very hilly, and probably not practical), so we decided to go elsewhere to get him to sleep. We went to Maruyama park about quarter mile away (passing a temple or two along the way). This is the same park where Anthony enjoyed the birds last week. He wasn't quite asleep as we walked around, and so we left the park via a way we'd not been before, and came upon one of the most amazing sites I've ever seen in Japan. It turns out that we'd come upon the site of the Yasaka Shrine (a fairly famous shrine, apparently). It's actually part of the park, although I didn't know that at the time. Anyway, what was so amazing was that it was beautifully lit up, with the surrounding area very clean, and there was almost no one around. Normally, anything of beauty in Japan in which the public is allowed to go is immediately saturated in smoke, garbage, unruly kids, and crowds. This had none of that. It was unreal. As we walked around that area, we came upon a small street that was equally beautifully lit up, with small little restaurants lining it. While we could see people in the restaurants, the street was eerily empty. I felt as if I'd wandered onto some mostly-deserted movie set built to some westerner director's idolized concept of what old, quaint Japan should have looked like. I commented to Fumie that had I really been on such a set, I would have told anyone who would listen that you'd never find a place like this in Japan. It was so peaceful and beautiful as to be moving. And all within a 10-minute walk from our apartment. Thankfully, Anthony had fallen asleep by this time, and we were getting tired, so we left movie-set Japan behind and came home by 9pm or so. After putting Anthony in his futon, we took a bath. I then had a glass of Chinese lemon wine (yummy) while putzing around on the computer. I was getting tired, but since the bath my left eye had been slightly irritated (dry, or something), so I thought I'd check it out in the mirror before heading to bed. I was aghast to find that the lower-outside corner of my left eye had essentially turned into a disgusting mass of semi-transparent slime. It looked as if I should be able to just pick it off my eye, as if a leech had attached itself (and believe me, I tried), but after a while I decided that it was not something growing on my eye, but the eyeball itself. Needless to say (but I will), I was fairly freaked out. It didn't affect my vision, but was physically slightly uncomfortable, and mentally very uncomfortable. I still have full health insurance with Kaiser in California, so called them (6:30am their time). I talked to an advice nurse, and after describing it as best I could, she had no idea what it might be. Looking to local medicine, after a few phone calls by Fumie, it turns out that the Kyoto City College of Medicine's Hospital is not too far away, and even at night (it was now 10:30pm), they had an eye doctor available. So, I headed off on my bicycle, arriving in about 15 minutes. I waited for about five minutes before someone came to help the person in line in front of me. Once they were helped, I waited for someone to come back so I could register, and while waiting, some guy comes in carrying a crying 4-year-old. This guy walked around me, to stop directly in front of me (and so be directly in front of the registration window). I looked at him incredulously, and the old man at a nearby payment window did the same, motioning me that I should let him know what he'd done. But the guy had a crying baby — how could I ask the crying little boy to wait? I just let him go. I couldn't tell whether the guy was rude, or just not thinking about anything other than his son. I hope the latter. He never said anything to me the whole evening. Eventually, I got up there and filled out the paperwork. I was happy to be able to write my address down completely, although I realize now while writing this (the next day) that I'd swapped the order of the two characters used to write “Kyoto”. Doh! No one said a thing about it, though. It was also the first time I'd used the name “Jeffrey Matsunaka”, as that's what my insurance card was in. A bit later, in the waiting room, when the nurse called out “Matsunaka-san” and I (a big white guy) got up, she did a quick doubletake before gaining her composure and walking me to where the eye doctor was. The eye doctor was all business, skipping all the pleasantries and asking “what's the problem”. I showed her my eye, explained that it had just popped up a couple of hours ago, and that I'd never seen of anything like it. She looked at both eyes through the blindingly-bright slit lamp thingy that eye doctors use, jammed her finger into the affected eyeball, and after all of 30-45 seconds, told me that it was allergy related, that it's fairly common (mostly with children), that it should be gone by tomorrow, that she'll give me two sets of drops for it, and that if it's not gone by the next day, I should go see an eye doctor. Well, that was a relief. As I headed back to the waiting room (I must have been gone from it for 90 seconds), I was turning my phone back to non-silent and noticed a message from Fumie reminding me to be sure to tell the doctor about my former LASIC, and that I'd just moved from America, just in case they mattered. I didn't think they'd matter, but better to be safe than sorry, so I headed back to find her writing up the prescriptions. I told her, and she said that yeah, neither mattered, but she was visibly surprised that I'd had LASIC, and said that she hadn't noticed. I guess she's not used to seeing the quality result that I got with Dr. Mandel in California. I waited to be called to pay the bill. It turned out to be $33. Had we not signed up for insurance last week, it would probably have been $330 (you pay 10%-20% with the insurance), so the insurance already well paid for itself. I got my prescriptions (a steroid drop, and, I think, and antibacterial) and headed home. I'd been at the hospital for 50 minutes. When Fumie looked at the info sheet that came with the drops, she suddenly realized that what I have must be KETSUMAKUEN. I looked it up in a dictionary and found it to mean “conjunctivitis”, which means as much to me as “ketsumakuen”. A quick internet search showed it to be “pink eye”, which I've heard of, but thankfully had never known what it was. It's disgusting, and the pictures I found accurately describe what I had. Yuck. There are three varieties, two of which are highly contagious. I apparently had the third. Still, I washed my hands well, and made sure to stay clear of Anthony. I put the drops in and went to bed. April 16th, 2004 Getting Settled in Japan: Alien Registration, Bicycles, etc.